How about an update? 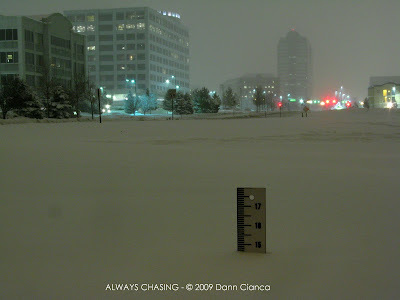 Well, I'll settle officially with 14" of snow at Greenwood Park (a neighborhood here in Centennial). Not exactly the 40"+ seen in the mountains or the 24" in other parts of the metro area, but still a decent total. Living close to work (I feel like a genius for choosing an apartment as such), I have been able to make it into work the past two days. In fact, I never even put Der Schploder into four wheel drive. My winter driving skills are legitimately that good. Seriously, though, the roads haven't been that bad. I think they still may hold some of the summer heat... or maybe it's just the magnesium chloride. While I did see some wind at my location, apparently it did not compare to that of the nearby plains. I would hardly say that blizzard conditions were met anywhere in the metro, but on the plains it is a certainty. I'm glad I'm not traveling (or heading back from a chase!). I'm not going to lie, I do enjoy a good snow storm. Don't feel so bad, GXY only got 10" or so. Cheyenne Ridge downsloping was a killer for us. There were times that moderate to heavy snow was over us on radar, yet it was only snowing very lightly. The low levels were just too dry u out here. It was a fun long-duration light snow event for me though. Hey, BTW I noticed my blog RSS link on your site is still named the default name and not "Storm Talk". Is that something on my or your end that needs to be changed? Im also working on adding a links list to my blog and will be adding your link. I am glad we have not gotten any flakes here (MI) as of yet. Whats the latest on the snow forecast for your area? And the show continues for Colorado! What a year for weather watching around there, wow. Sorry to you all for my delay on responding. I'm incredulously behind on e-mail at the moment. Matt: I'll have a look at the link. Kurt: Typically in El Niño years, we have active falls and springs, but the winter is tame. So far it's living up to that hype.